The earliest part of Amberley castle still standing is the lower part of the great hall, which was built in 1377 by Bishop William Reade. There has been a manor home on the site since 1103, but this was demolished and re-built twice before the current structure. In the same year of 1377 the Bishop applied for and was granted permission to fortify the hall, which allowed him to build walls up to 40 feet high and a gate house. Also during the same year the property officially became known as the Bishop of Chichesters Summer Palace. The castle has passed through a surprising amount of different owners in its time, being rented out and owned by a number of families up until the outbreak of the English civil war. Oliver Cromwell sent one of his generals to attack the castle which caused 20 feet to be destroyed from the tops of the walls, and also the destruction of most of the great hall. Shortly after the war it was restored to the Bishop of Chichester's possession but still rented out and later sold to a number of families. Today the castle has been renovated and turned into a hotel, and offers some of the finest rooms in the area. Amberley castle has its own resident ghost, named Emily. Who she was exactly is a mystery, but her apparition is easily the most commonly encountered spirit. Her story is simply that she died from committing suicide, but the reasons behind which are unknown. She has been described as wearing a Victorian style dress with long brown hair, and is always seen walking somewhere, often straight through walls. She is known to be a very friendly spirit, with people who have seen her claiming they felt a wave of calm when she appeared. The next spirit is not so friendly however, but fortunately only seems to be restricted to one area. There is only one room guests can stay in the hotel which has access to the battlements. 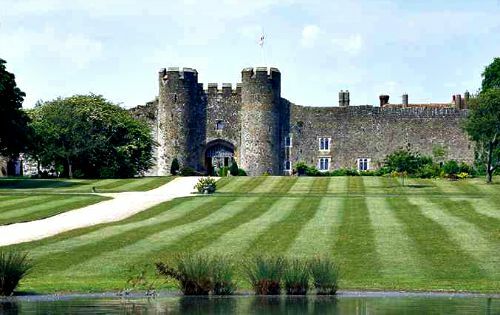 It is called the Herstmonceux suite and to reach the battlements from the suite you must pass through an empty room which is directly above the portcullis. It is within this room that an unhappy spirit seems to live, and though no one has actually seen him many people passing through this area have claimed to have suddenly felt an intense feeling of having someone right behind them, as well as being watched, definetly somewere you dont want to be alone in the dark.